More than 200 people are blockading a nuclear power station in protest at plans to build new reactors at the site. 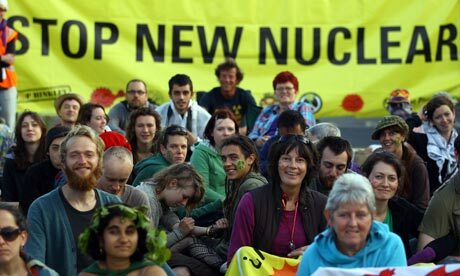 Members of several anti-nuclear groups that are part of the Stop New Nuclear alliance say they are barring access to Hinkley Point power station in Somerset in protest against EDF Energy’s plans to renew the site with two new reactors. The new reactors at Hinkley would be the first of eight new nuclear power stations to be built in the UK. The protesters began their blockade at about 7am on Friday, with a theatrical troupe who “enacted a nuclear disaster scenario similar to Fukushima”, the power plant which was badly damaged during the earthquake which struck Japan on 11 March. Most are local people but demonstrators also came from Belgium and Germany. Stop New Nuclear spokesman Andreas Speck said: ”This is the start of a new movement. We intend this day to be a celebration of resistance against the Government and EDF Energy’s plans to spearhead the construction of eight new nuclear power plants around the UK. This entry was posted in Energy, Nuclear power stations and tagged climate change, Environment, protest. Bookmark the permalink.